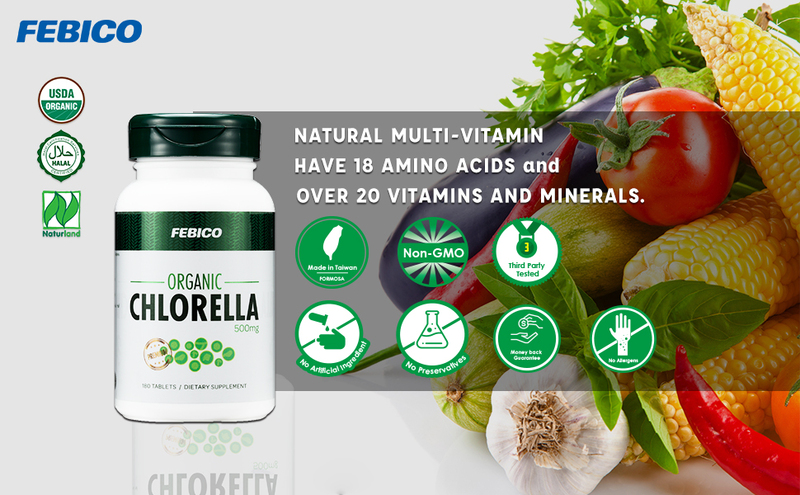 What is Febico Organic Chlorella? [PURE ORGANIC SPIRULINA FROM TAIWAN]: Febico has 140,000 m2 manufacturing site with over 60 microalgae culture ponds, and the production facilities are certified by HACCP, ISO 22000. Plus, both spirulina and chlorella certified by USDA National Organic Program (NOP), Naturland, Halal Certificate. Provide you the purest and the cleanest spirulina and chlorella. [Purity- Nothing but Spirulina]: The finest ingredients which is cultivated in pure mountain spring water, unpolluted area and sunny sunlight. 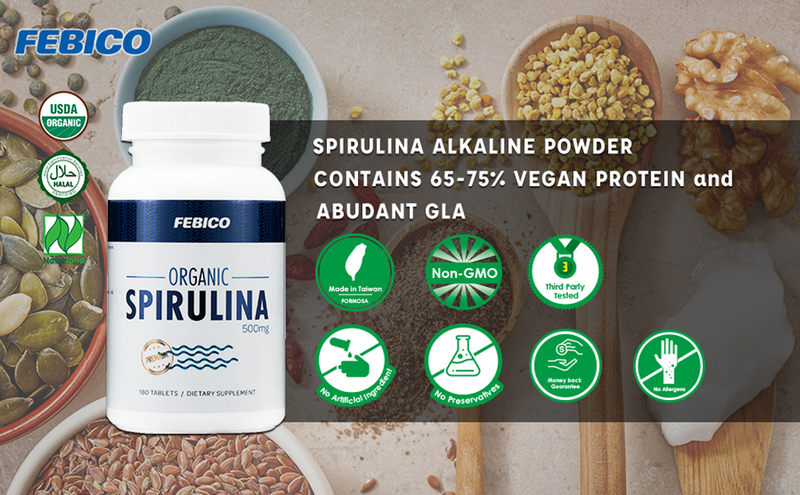 Febico’s spirulina is no GMOs, no binders, no artificial colors, no artificial flavoring, and no preservatives added, just the best 100% pure spirulina nutritive ingredient. Also, 100% vegan friendly. [Boost Energy and Supports Immunity]: Spirulina riches in beta-carotene and the essential fatty acid GLA, iron, B-complex vitamins, vitamins D, E and C, along with potassium, selenium, manganese, copper, chromium, magnesium, phosphorus and zinc. Spirulina provides support for the body’s immune system and also the energy to recover quicker. [Nature Alkalizing Superfood]: Spirulina is rich in protein containing all the essential amino acids. It contains the highest concentration of protein of any plant, herb or animal on per gm basis. It contains 70% of Vitamin B12 complex, and 18 kinds of Essential Amino Acids and antioxidants. Boost your daily energy with all nature sourced vitamins! [Daily Green Latte with Spirulina- Get Extra Energy]: Start your morning with Fresh Green Latte? Add Febico spirulina powder in your green latte or mixed with drinks, smoothies or added in meals like salads or appetizers to elevate nutrition facts. As one of the top superfoods in the world, it can provide nutrition to help support many organs and bodily functions. Where do Fish Get Their Omega 3? From Algae! Where do Fish Get Their Omega3? From Algae! [Necessity During Pregnancy]- 500 mg/V-Capsule, 60 Capsules/bottle. Contains microalgae DHA, Astaxanthin, PS(Phosphatidylserine), Lecithin. The perfect combination-DHA+PS+PC(Soy Lecithin) of brain support and development of pregnant woman and fetus. 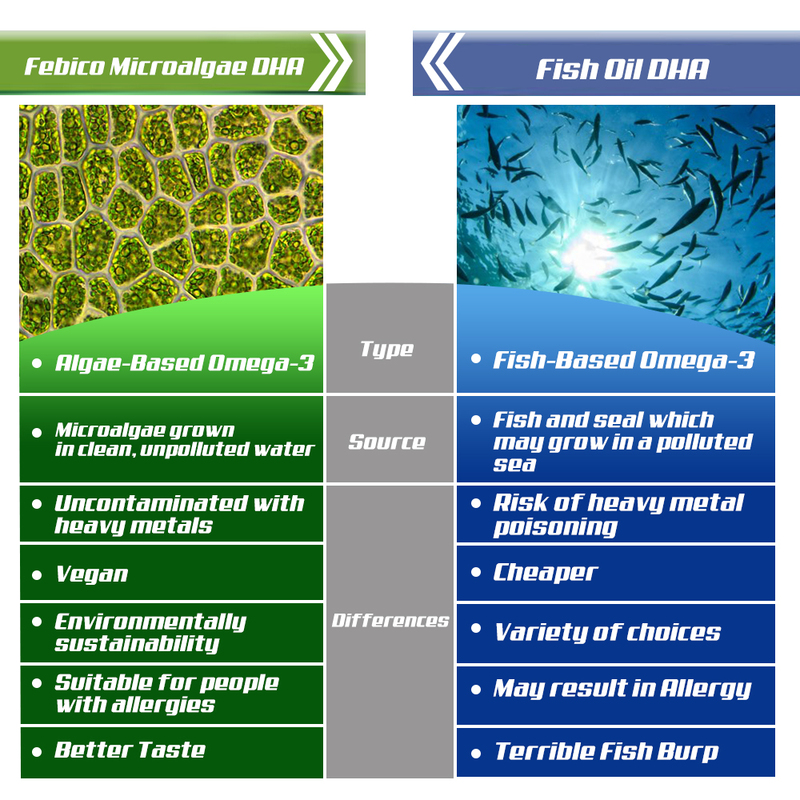 [Not Only DHA]- Febico DHA capsules offer suitable dosage and pure quality of fatty acids, sufficient Lecithin, astaxanthin and other vitamins to support maintaining cellular fluidity, normal memory, cognition, emotional well-being, and vision. [No contaminated]- Extracted from microalgae , 100% vegetarian supplement. Free of toxins and allergens from fish oil. Moreover, Febico uses supercritical CO2 extraction to prevent any residues and pollutants in DHA oil. [Easy to Swallow]- Vegan and small size capsule, made from HPMC; easy to swallow and with no suffering while taking. Algae based source has no fishy smell taste or aftertaste. Ensure that you get daily recommended amount DHA without any burden or unpleasantness. [Quality Certified]- Febico is well known as an algae series supplement manufactory, all the products we provide are manufactured by an FDA approved and HACCP licensed factory. High quality guaranteed.